Entering Castle Ward near Strangford this year, visitors will arrive through a gateway of magic, leading to the old world Stableyard full of activity and atmosphere. Children can colour-in, write and post their letter to Santa, before boarding the Santa Express that will lead to Santa’s House hidden in the woodlands of Castle Ward! Santa Claus is getting ready for his visit to Castle Ward soon. Children will find Santa sleeping on his rocking chair by a log fire in his sitting room, together they will waken Santa and he will then reward them by telling a wonderful story of Christmas at Castle Ward. 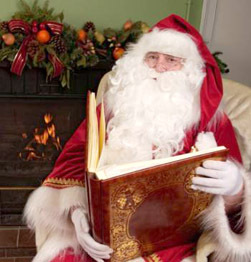 After Mrs Claus serves warm mince pies and mulled punch, Santa calls each child by name to receive their beautiful gift. Everyone then leaves through the elves workshop before boarding the Santa Express for the return journey by the magic light trail to the Stableyard. Santa’s House and Workshop is a fabulous Christmas experience enjoyed by thousands who travel from across Ireland, don’t miss your opportunity to meet Castle Ward’s Santa and Mrs Claus this year. Cost per Adult £7 Child £15. Booking is essential to visit Santa’s House which will be open Wednesdays to Sundays from 28 November – 20 December, contact 028 4488 1204 for further details.